Aims: to play a game about encouraging others. You will need: masking tape and at least two plastic cups. Before the session stick two strips of masking tape to the floor. The strips should be parallel to each other, at least three meters in length and be approximately one meter apart. Divide your group into two teams and ask for a volunteer from each. Designate one strip of tape to each team. Ask the volunteers to stand at one end of their tape while the rest of their team stands at the other. Explain that during the challenge the volunteers will need to walk along the strip in front of them. However, the volunteer can only take pigeon steps and must keep a plastic cup balanced on their head. If the cup falls to the ground, they should stop and place it back on their head. While the volunteers walk towards their team, the team members should encourage them – they can do this by calling out words of encouragement (competing with the other team to be heard!) or they can do it in silence i.e. smiling, beckoning and giving a ‘thumbs-up’. If a team stops giving encouragement their volunteer should stop walking along the strip of tape. When the first player reaches their team they should hand the cup to a second player. The second player should run to the opposite end of the tape, place the cup on their head and start walking. The team should again encourage the player as they walk along the tape. A team should sit down when all their players have competed. The first team to sit is the winning team. For an alternative game about encouragement see Printables. You will need: a large sheet of paper or a whiteboard marker pens, and a Bible. 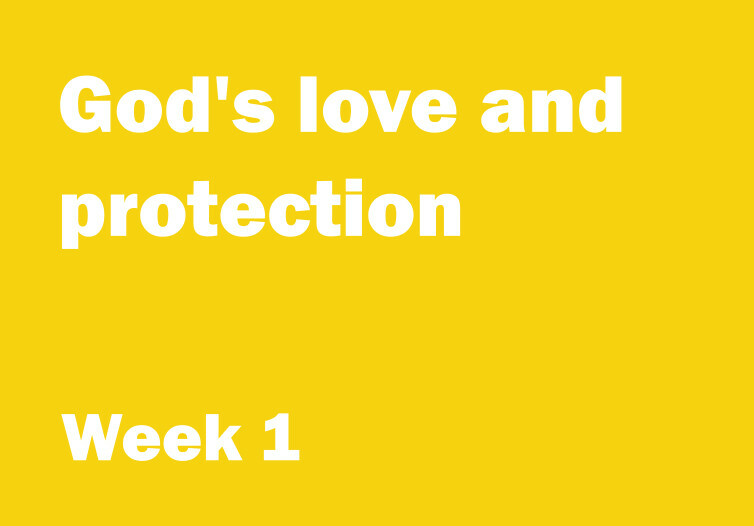 Read the verse aloud and explain that this verse will help us learn more about God’s love and protection. Underline the word ‘Hebrews’. Point out that this month’s verse comes from the Book of Hebrews. Encourage one of the children to find ‘Hebrews’ in the Bible. Explain that ‘Hebrews’ is a letter. People who study the Bible aren’t sure who wrote the letter but they think it was written to a group of Jewish Christians. However by reading the letter we can tell that it was written to a group of people who were having a tough time. How do we know this? We know this because much of the letter is about not giving up. The letter encourages the reader to keep going in the middle of troubles and difficulties. Talk about the game the children have just played. Talk about how being encouraged made them feel. Talk about doing something difficult or going through tough times and how encouraging words can make us feel better and help us keep going. Talk about some of the things we might say to encourage people: ‘you’re great – you can do it’, ‘you’re good at this’, ‘don’t give up, you’re nearly there’. If possible talk about some of the examples from the game the children have just played. If the children played the team game, remind them that they had to keep the cup balanced on their head – talk about why this was difficult to do. Explain that the first readers of ‘Hebrews’ were having a difficult time because they were Christians. Many of the people around them didn’t believe that Jesus was God’s Son. They tried to stop the Christians believing; they tried to stop them telling other people about Jesus too. Amongst all the unkindness this letter arrived – ‘Don’t give up’ it said, ‘keep going’. Point to the verse again and explain that next week we will take a closer look at this encouraging verse.